One of my missions during my most recent trip to New York was to get Michelin-starred restaurants under my belt but also not overspend. 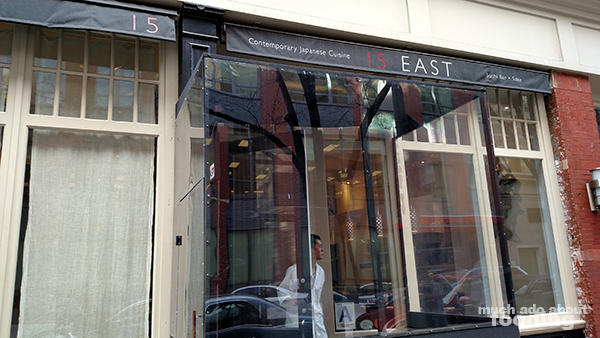 I spotted 15 East on a list of places to try for lunch at a somewhat affordable but quality rate, and when have I turned down the opportunity to have sushi? I made reservations for my friend and me and visited with the intent of just doing a small lunch. Instead, we were tempted in by other options which were definitely had without regret. It is a demure place instead with a subtle beauty to it all, and the quiet, calm environment makes you almost want to whisper to your fellow diner(s) while appreciating the craft of your meal. 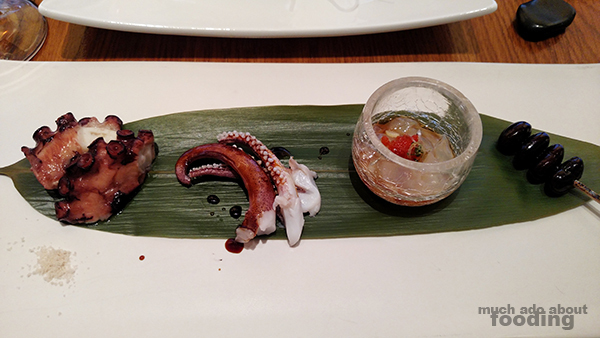 Our waitress suggested to us to start with their hot appetizer plate to add onto our omakase order. I cannot recall the name of this style unfortunately but it featured a selection of hot and cool morsels that we hadn't previously seen. A grilled chunk of octopus to start was a fantastic way to get my salivation going, and then the tender tentacles of squid in a savory glaze continued that feeling. My favorite portion of this was the cold baby jellyfish that seemed to swim in a soy-based broth because of its texture and overall flavor. We finished with thick skewered beans that came off so much meatier than the rest of the assortment which had a levity to their bites. Typically, this plate would have each been tacked onto our individual orders but we just wanted to share for brief tastes. 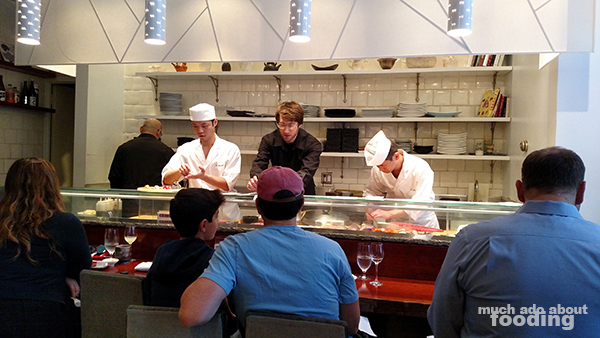 We each had the Sashimi & Sushi Omakase ($60 - five kinds of sashimi, five kinds of sushi, and a half roll) so our meals were based on the fresh fish selection of the day as determined by the chef. Tender slices of sashimi melted in my mouth as I made my rounds through the plate, particularly the fatty toro that coated everything in its natural oiliness. 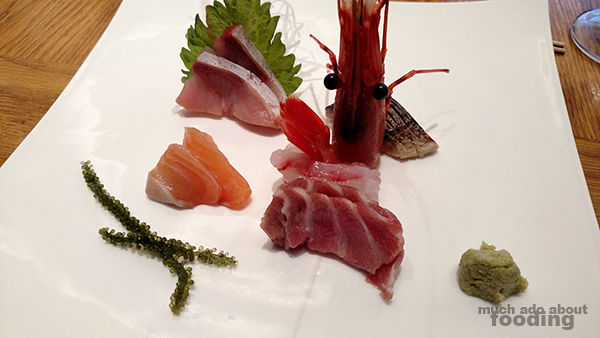 I had my shrimp head returned to me later in a hot soup, given that option or tempura-ed. 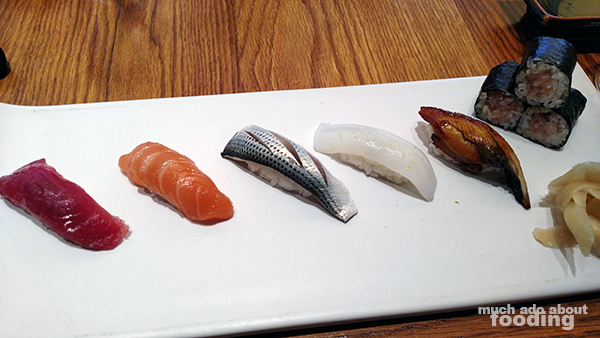 The nigiri that came out next was thoughtfully picked out and included ika (squid) which was a pleasant surprise. Most places would just choose fish exclusively but including squid provided a variation of texture that was most welcome. There was also the lightly glazed eel that proved to be one of the best bites in the line-up. A yellowtail roll however stole the show, not because of any roll leaning we had but because we both love yellowtail and this was represented very well here. Satisfied with the savory stuff, we could have ended the experience there but the dessert menu was very intriguing with ingredients that we were curious about. 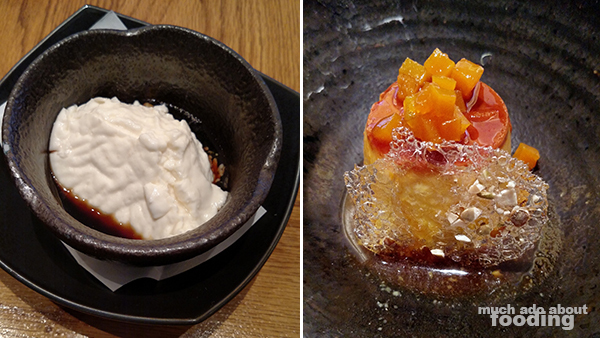 I went for the Mineoka ($12 - milk sesame pudding, kurosato syrup) and my friend for the Kabocha Creme Caramel ($12 - japanese pumpkin flan, pumpkin seeds) since he makes creme caramel often. What came out for my dessert was a little unexpected since I thought my pudding would present in a more solid form - however, this was not a problem because the dish was just so, so good in its own right. That Japanese black sugar (kurosato) was unbelievably perfect and not too sweet for everything overall. In fact, the pudding was light in taste but smooth and silky in texture; it reminded me a little of the silken tofu desserts I've had back home but with more sophistication and a pronouncement of sesame. It was lovely and certainly seductive. My friend's kabocha flan was perfectly balanced as well with a blend of textures that made it all both creamy and crisp, viscous and syrupy. If I could come back and sit down for just dessert, I would come back to 15 East in a heartbeat...and I'm not even a sweets lover!